The 2018 Veals Winter League is nearing climax after round 6, the penultimate match. The competition was fished at Littleton-upon-Severn in South Gloucesterhire. By far the hardest match of the league so far. The anglers were all extremely lucky to get a break in the weather after a stormy period. Conditions were ideal with very little wind and no rain. This made the fishing quite a pleasant experience, but a serious lack of any sizable fish didn’t help the contest. Sea angler Jack Reynolds of Worlebury did really well, in only his second Veals League match, winning B zone. The twelve-year-old junior beat some well seasoned senior match anglers in B zone, including, the league leader, Steve Ace and Keith Warren. 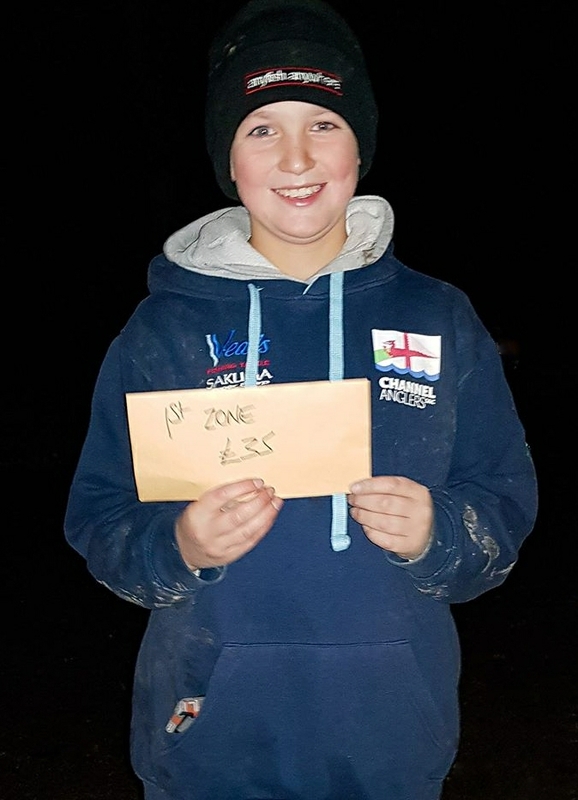 Jack’s catch weighed in at fourteen and a half ounces enabling him to scoop the main prize of £35. Jack was using a Zziplex Match Pro sea fishing rod with an Infinity 8000 reel. The reel was sponsored by Michael Busby of Weston-super-Mare. He was using three-hook clip downs and three-hook flappers with lugworm bait. He is a Year 8 pupil at Worle Community School in Weston-super-Mare and a member of Bristol Channel Fishing – Supporting Angling Communities, where he takes part in match fishing for Channel Anglers.